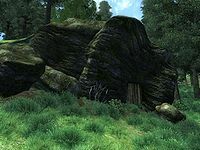 Bloodmayne Cave is a medium-sized cave west of Bravil containing bandits (quest-related). 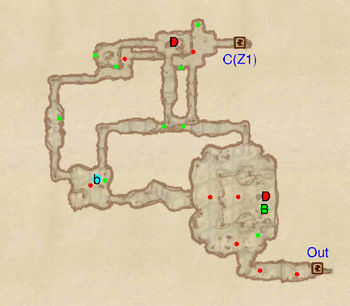 It contains two zones: Bloodmayne Cave and Bloodmayne Cave Labyrinth. The fugitives will only appear during the related quest, and will not respawn. Before and after the quest, the cave is inhabited by monsters and animals. There is a second entrance to this cave (NW of the main entrance) which does not have a map marker. This cave contains 20 Cairn Bolete plants and 17 Wisp Stalk plants. Bloodmayne Cave also appears in ESO. 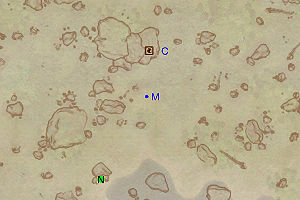 This location's map marker (M on map) is named Bloodmayne Cave (editor name BloodmayneCaveMapMarker). The entrance door is N of the marker, 60 feet away. 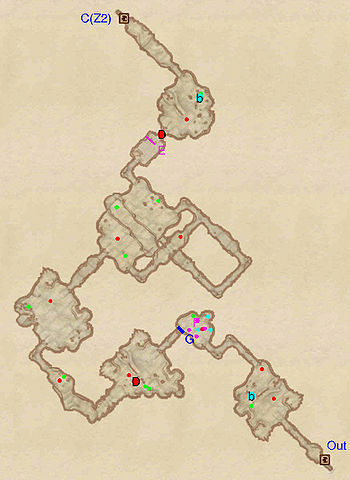 During the related quest, this area will contain two fugitives: Hlofgar and Ashanta (D). They are found in the third and last room respectively. Outside of the related quest, you will immediately face two monsters guarding a minor loot chest and a bedroll (b). The next room contains three gas traps and another chest. To open the rock wall at G, pull the rope on your right as you enter. Pass through two rooms and the corridor linking them, battling three enemies and looting four chests. You arrive in a large room bisected by a canyon, with a monster and a chest on your side and wooden planks leading across to the other side. Instead, jump down, loot the chest nearby and wind your way back up to other side, where another chest awaits. Avoid the log trap at E and make your way to the final room, where a monster guards a chest, a bedroll (b) and the door (C) to the Labyrinth. During the related quest, Dreet-Lai will be stalking an area directly above you and will likely be alerted to your presence as soon as you enter. Enrion can be found in the final room. 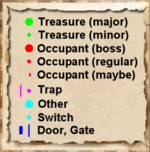 Outside the quest, the first room contains a monster and two minor loot chests. Once they're taken care of, head south and up the winding tunnel. Loot the chest in the second room before jumping back down, where a monster and another chest await. The next room contains a monster guarding a minor loot chest and a bedroll (b). Head north to loot another chest, at the end of a caved in corridor. Track back and press east: you will emerge in the final room and will have to fight 3 to 4 enemies at the same time. Once you've dispatched them, loot the boss chest at B and head north. The tunnel ends in another dead end but there is a minor loot chest to make it worth the effort. Track back, loot another chest and fight your way past two more monsters before heading outside through the door at Out.